Benefits of Good Oral Hygiene - Jennifer A. Yue, D.D.S. Good oral hygiene isn’t just about having an attractive smile. It is also about the affects on your overall health and your daily routine. Taking care of your mouth, teeth and gums is a worthy New Year’s goal in and of itself. Who doesn’t want a whiter and brighter smile? To most of us, brushing our teeth at least twice a day is a no brainier, right? Surprisingly, people are slowly becoming aware that that their mouth matters. Here are some of ways good oral hygiene can benefit your life. Without good oral hygiene, bacteria can reach high levels that could lead to oral infections. Which can cause tooth decay and gum disease. If you suffer from gum disease (aka periodontal disease), bacteria from your mouth can get into your bloodstream and can cause more problems than you can even imagine. A study conducted by the CDC found that 64.7 million American adults, have mild, moderate or severe periodontitis, the more advanced form of periodontal disease. 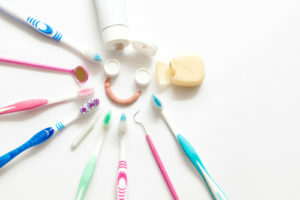 Heart disease, diabetes, stroke and obesity are just a few of the connections that have been suggested between gum disease and other illnesses and conditions. There’s nothing worse than trying to chew food or drink something cold with a sharp pain in your tooth or sore gums. If you can’t chew properly, not only can this deter you from eating your favorite foods, but it can also lead to stomach problems. Poor oral hygiene leads to bad bacteria that becomes present in your saliva. Which then travels to your digestive tract when you swallow. Not only can this cause an imbalance in your digestive system, but can also subsequently cause digestive problems. Avoiding sugary, sticky foods and beverages is also a good way to prevent tooth decay and pain. When you first meet someone, either for personal or professional reasons, your appearance will often directly affect the tone of the interaction. If you greet someone with a big smile, only to present them with yellow teeth and bad breath, you will most likely leave a lasting impression for the wrong reasons. We all know that a warm smile exudes pure confidence and positivity. So don’t let your subpar oral hygiene habits stop you from doing just that. There are some simple things you can do on a daily basis to keep your teeth white and your breath fresh. Rinsing your mouth after eating acidic foods, and chewing sugarless gum after eating a variety of crunchy natural foods. There are also treatments you can have done to make a more dramatic difference. Such as creating coverings (veneers) over darker, worn teeth that can recapture what your smile once looked like. Good oral hygiene isn’t just about having an attractive smile. It is also about the affects on your overall health and your daily routine. It is good practice to brush your teeth and floss twice a day. In addition having your mouth professionally cleaned will remove tartar and plaque. This will significantly reduces the risk of developing serious illnesses and conditions. Schedule your appointment with Dr. Jennifer Yue today to improve your oral and your overall health!